Nearly three years after drunk NASCAR fan No. 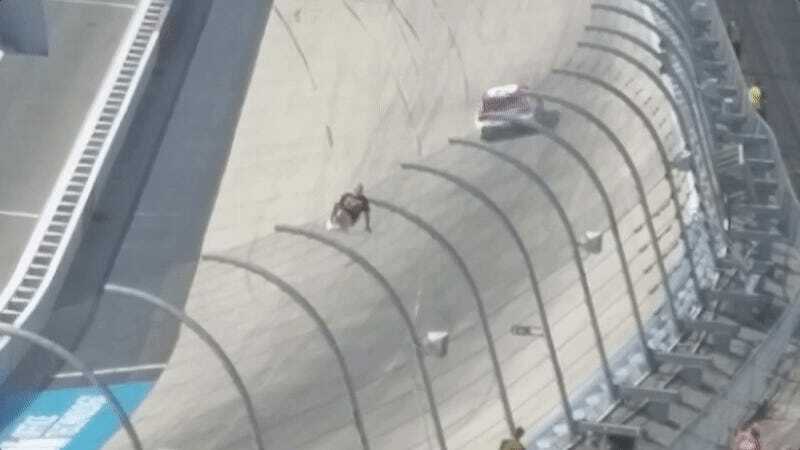 1 climbed the catch fence during a race at Richmond International Raceway, it happened again Sunday. NASCAR never even threw a caution for this guy, and USA Today reports that local police said he “kicked an officer in the knee” while being taken into custody. This fan, identified by USA Today as John Infanti, was at Dover International Speedway over the weekend and reportedly went up the turn-four fence during a green-flag run in the Monster Energy NASCAR Cup Series race. Unlike what happened in Richmond in 2014, no caution was thrown for Infanti. While the video doesn’t show Infanti climbing the fence initially, it must have been fast enough to escape the attention of, you know, people who could have stopped him. “Simply running from the police is a misdemeanor, but when he kicked our officer, that makes it ‘with force.’” Hoffman said. The kick resulted in the felony charge for resisting arrest. Infanti also faces two misdemeanor counts: disorderly conduct and offensive touching of a police officer. As of Sunday night, USA Today reported that Infanti would be held for at least eight hours and that he would go before a judge to determine his bond. Fox Sports reported in December 2014 that a judge sentenced the Richmond fan, James Dennis, to a year in jail for public intoxication and disorderly conduct. Fox Sports also reported that Dennis had to pay a $100 fine for each count. By now, you’d think people would know not to climb a giant fence used to keep spectators safe at a high-speed car race. But, then again, Ricky Stenhouse Jr.’s dad did it in May and got a golf-cart ride to victory lane. You never know until you try, but maybe try something a little safer than this. Update, June 5 at 3:36 p.m. ET: A reader sent Jalopnik a couple of photos from the scene, which are too great not to share. Note that Infanti is missing a shoe, too.